Tomorrow’s college football games are like the playoffs for Oregon and Auburn, as they are both one win away from playing in the National Championship game on January 10th, 2011. If they both win, they will play in the 2011 BCS National Championship Game at the University of Phoenix Stadium in Glendale, Arizona. 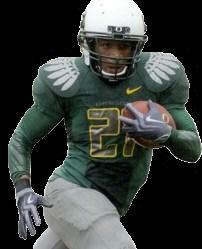 The University of Oregon plays their traditional Civil War game against their state rival Oregon State University. Auburn University is playing South Carolina for the second time this year in the Southeastern Conference Championship game. Both teams are undefeated (Oregon 11-0, Auburn 12-0) going into tomorrow’s game. Which one of these teams has the biggest chance to lose their game? The University of Oregon has amassed points like no other college football team this year. They are ranked #1 in points, averaging 50.5 per game. Other than the Cal game, the O has scored at least 42 points in every other game. 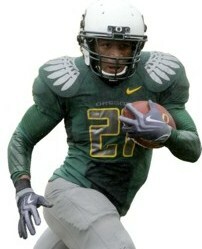 Running back LaMichael James’ stats have put him in the running for the Heisman Trophy. He has 1,548 yards and 19 touchdowns this season, averaging 6.1 yards per carry. He is averaging 154.8 yards per game and leads the nation with an average of 12 points per game. The Oregon running game is 5th in the nation averaging right at 300 yards per game. Quarterback Darron Thomas compliments the running game with a total of 2,373 passing yards. He has a quarterback rating of 152.23, and has thrown 26 touchdowns to only 7 interceptions. With the dynamic duo of LaMichael James and Darron Thomas, the spread-option offense is leading the country with 541.7 total yards per game. Although Oregon’s defense typically starts off slow, they are still ranked 15th in the nation, giving up an average of 18.3 points per game. They are fantastic in the second half of games. The team has allowed only 64 total points after halftime this year, and only 14 in the fourth quarter. They have had two shutout games, and the most points given up in a game this season was 32 against USC. The University of Oregon has beaten three top 25 teams this season, and their closest win margin was a 2 point victory over Cal. Other than that one game, Oregon has dominated their opponent, winning 9 of their 11 games by 19 points or more. I don’t think that Oregon State (5-6), although a huge rivalry game, really has a chance to stop this potent offense, and therefore feel that the University of Oregon will not be upset. Auburn sits at the top of the BCS standings, and is almost as impressive on offense as Oregon. They have their own Heisman Trophy candidate in quarterback Cam Newton. He has been unstoppable for the Tigers, as he has done almost as much as LaMichael James and Darron Thomas combined. On the ground Cam has amassed 1,336 yards, averaging 5.9 yards per carry with 18 touchdowns. In the air, Cam has thrown for 2,254 yards with 24 touchdowns and only 6 interceptions. He ranks second in the nation, completing nearly 68 percent of his throws, and has a quarterback rating of 185.56. Auburn’s offense as a whole is 7th in the nation averaging 41.6 points per game, and 6th in the nation in rushing yards, averaging 291.3 per game. Auburn has had more close games, with 5 being won by 7 or fewer points, and another game they won by only 8. Auburn has had to make four comebacks being behind by more than double digits this season, including coming back from a 24 point deficit against Alabama to win 28-27. In Auburn’s second game of the season, Mississippi State had an interception dropped that could have been returned for a touchdown, and late in the game their receiver dropped a pass that would have put them in position to at least go for a game tying field goal. In their very next game of the season, Auburn had to come back from a 17-0 deficit to beat Clemson in overtime. Again, it was Clemson who missed a 27 yard field goal to give Auburn the win. The very next week, Auburn had to come back from a 20-7 defecit against South Carolina. The South Carolina quarterback fumbled twice in the fourth quarter, allowing Cam and the Auburn Tigers to score two touchdowns. On two additional drives by South Carolina in the fourth quarter, they threw two interceptions in Auburn territory to end their drives. Two weeks later against Kentucky, the game was tied at 34 with 7:31 left. Auburn then went on a 19 play drive that ended in a game winning field goal with no time left on the clock. Two weeks after that game, Auburn found themselves tied at 17 in the fourth quarter against LSU. If it wasn’t for a big running play of 70 yards with 5:05 remaining in the game, who knows what the outcome may have been. Just another narrow escape by Auburn. Auburn has a much tougher matchup for their final game, playing against No. 18 South Carolina (9-3). Not only has South Carolina played Auburn before, they actually had 4 turnovers in the fourth quarter to eventually allow a comeback win by Auburn. I don’t see that happening again. 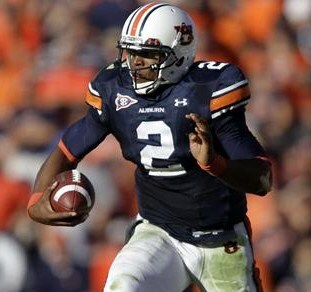 Also, I feel that Auburn is very one-dimensional in that Cam Newton is the catalyst that has provided almost all the comeback victories single-handedly. If there is an upset to be had, the matchup between Auburn and South Carolina is much more suited for it. ~ by Troy Erickson Realtor on December 3, 2010.